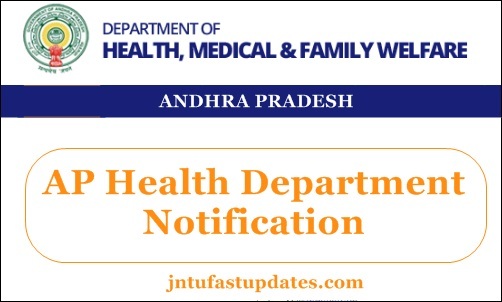 AP HM & FW Notification 2018: Andhra Pradesh Health, Medical & Family Welfare Department released the notification for 1604 Assistant Professors, Civil Assistant Surgeon and Dental Assistant Surgeons posts. Candidates waiting for AP Health Department Notification can apply for the announced posts at hmfw.ap.gov.in. Applicants can find the online application on the same portal. Aspirants can apply within the scheduled dates. Late application forms will not be accepted by the organization. Hence, the qualified hopefuls can apply within the announced dates. AP Health Department Notification 2018, eligibility criteria, application and selection process details were clearly mentioned in this article. Andhra Pradesh Health Department works for the health department related recruitments and other purposes. The organization has now announced the recruitment notification for 1604 assistant surgeon and DME posts. Candidates aspiring to apply for the announced ports can proceed to apply through the official portal, hmfw.ap.gov.in. Applicants must have the postgraduate degree in the medical stream from any recognized board/university. And the minimum age limit of the applicants must be 18 years. Maximum age limit will be as per the category the applicants belongs to. Candidates will be selected through written test and interview rounds. More details of the application process, vacancy details, important dates, and others have mentioned in the AP Health Department Official Notification 2018. Aspirants seeking to apply for the assistant surgeon and DME posts must refer the notification from the attached documents below. As per the notification, applicants must have a medical degree/postgraduate degree from any of the recognized university. Also, it will be an added advantage if the applicants have the experience in the relevant field. Minimum age limit is 18 years and the max. age limit will be shortly announced by the organization. Preferably, aspirants belong to reservation category will have the age relaxation facility as per the government norms. Aspirants shortlisted in all the selection rounds with good merit will get good pay scale as per norms. For more details candidates can go through the official notification attached below. How to Apply For AP Health, Medical & Family Welfare Department Jobs 2018? Click on AP Asst. Professors, Civil Assistant Surgeon, Dental Asst. Surgeons Recruitment 2018. 1.2 How to Apply For AP Health, Medical & Family Welfare Department Jobs 2018?